New U.S. national scope school district demographic-economic interactive tables are now available. These tables include approximately 600 subject matter items derived from the American Community Survey 2012 5-year estimates for each of the approximate 13, 600 school districts. Use the interactive ranking tables to view, query, rank, compare demographic-economic characteristics of the population and housing for states and/or metros of interest. A scroll box is provided for each section that lists each of the subject matter items available for each area in the table. The graphic below shows percent college graduates by school district in the vicinity of the Dallas-Fort Worth-Arlington, Texas metro (bold brown boundary; county names shown as labels). Click graphic for larger view and details; McKinney ISD profile shown in expanded view. Similar pattern analysis views may be prepared for any of the items in the tables. These data provide “richer” demographic-economic characteristics for national scope states and metros. While Census 2010 provides data similar to those items in the General Demographics section, only ACS 2010, 2011, 2012 sourced data provide details on topics such as income and poverty, labor force and employment, housing value and costs, educational participation and attainment, language spoken at home, among many related items. The approximate 600 items accessible via the tract dataset are supplemented by a wide range of additional subject matter. ACS 2013 school district data become available in late 2014. GIS tools and data resources enable easier and more comprehensive mapping, geospatial and demographic analysis of census tract geography to examine low and moderate income (LMI) area pattern and characteristics. Resources are reviewed in this section to analyze LMI data by census tract. Though focused on LMI applications, the resources may be applied to a much broader set of census tract mapping and demographic-economic pattern analysis. Low and moderate income designation is closely associated with implementation of the Home Mortgage Disclosure Act (HMDA) and the Community Reinvestment Act (CRA) and is widely used in many other applications as a measure of economic prosperity. The HUD Community Development Block Grant (CDBG) program seeks to expand economic opportunities for LMI areas. Of the 72,581 Census 2010 census tracts (U.S. and Puerto Rico), 5,588 are designated low income and 15,998 are designated as moderate income based on 2013 HMDA designations. Use tools described in detail at http://proximityone.com/tractslmi.htm to analyze LMI areas of interest. Optionally set your own designations of LMI. 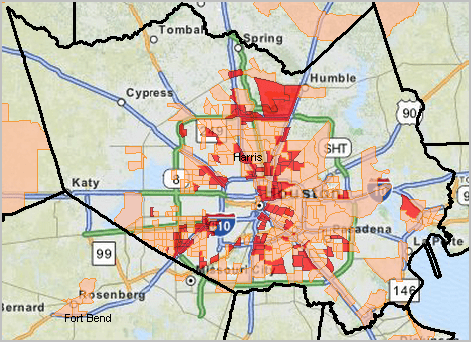 The following view shows a thematic pattern map of census tracts by low and moderate income status in the Houston, Texas area (red: low; orange: moderate). In this section we will review how, in just a few steps, you can develop maps like this one for your areas of interest, and others with further drill-down and labeling, using ProximtyOne no-fee resources. These resources enable national scale applications and include all Census 2010 census tracts. We have integrated HMDA “Census 2013” data with American Community Survey demographic-economic data into a U.S. national scope shapefile. It has been made a part of a ready-to-use GIS project. See details and additional details. How are the demographics of states changing … and why? 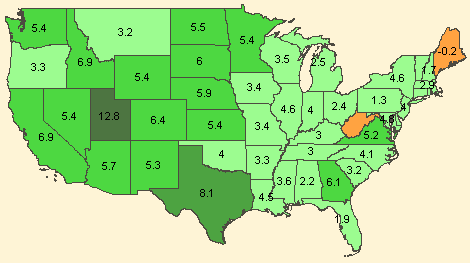 Based on the new 2013 population estimates and components of change, the population percent natural increase ranged from -0.55% (West Virginia) to 12.5% (Utah) during the period 7/1/2012 to 6/30/2013. 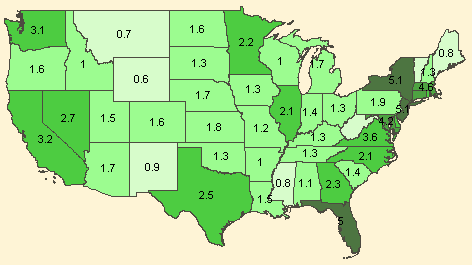 This is one example of insights into the components of population change that can be determined using the interactive table in this related section to view, compare, rank state population estimates and components of change. More about these estimates. Use the CV XE GIS state population estimates GIS project to create thematic pattern maps such as shown in the above graphics. Develop thematic pattern maps using any of the items included in the interactive table. Members of the ProximityOne User Group (join now, no fee) may download the ready-to-use GIS project. The Charlotte-Gastonia-Rock Hill NC-SC Metro and Austin-Round Rock-San Marcos TX Metro are roughly the same size based on total population. How do they compare based on educational attainment? percent population in poverty? homeownership rate? age distribution? migration? employment by industry? occupation? How do business opportunities compare? What about other metros? Choose from hundreds of measures in the state/metro demographic-economic interactive tables to compare and contrast states and metros based on side-by-side comparisons. The U.S.-State-Metro Demographic-Economic interactive tables provide a useful resource to view/compare geographies when ranked on a specific subject matter column of interest. The interactive tables are also useful to view a selected set of geographic areas where subject matter fields are arrayed horizontally for each geographic area. The U.S.-State-Metro Demographic-Economic interactive tables are available in the following Web pages. … side-by-side comparative analysis profiles can often add more to insights. Create “comparative analysis profiles” using data presented in the interactive tables. View demographic-economic attributes of selected geographic areas of interest in a side-by-side manner. Place the data in a spreadsheet for further analysis, linking with other data and/or printing or adding to a report. Step-by-step instructions to create comparative analysis profiles are provided at http://proximityone.com/usstcbsa_dp.htm. Select states and/or metros of interest. Create spreadsheet files for immediate use; save for future applications. 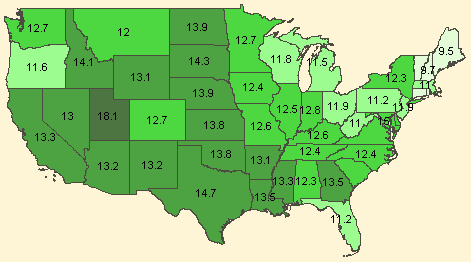 New U.S. national scope state and metropolitan area demographic-economic interactive tables are now available. These tables include approximately 600 subject matter items derived from the American Community Survey 2012 1-year estimates. These data provide “richer” demographic-economic characteristics for national scope states and metros. While Census 2010 provides data similar to those items in the General Demographics section, only ACS 2010, 2011, 2012 sourced data provide details on topics such as income and poverty, labor force and employment, housing value and costs, educational participation and attainment, language spoken at home, among many related items. The approximate 600 items accessible via the tract dataset are supplemented by a wide range of additional subject matter. ACS 2013 state and metro data become available in September 2014.
the sum of net earnings by place of residence, property income, and personal current transfer receipts. This section, updated quarterly, summarizes tools available to analyze patterns of state personal income. See the calendar for schedule. State personal income growth slowed slightly to 1.1 percent in the third quarter of 2013, from 1.2 percent in the second quarter. 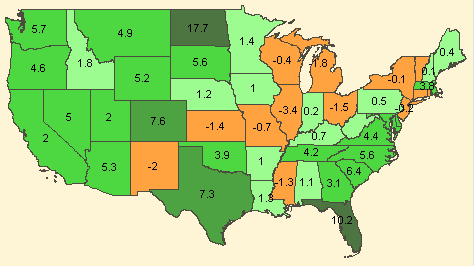 Growth slowed in 25 states, accelerated in 22, and was unchanged in 3 states and the District of Columbia. 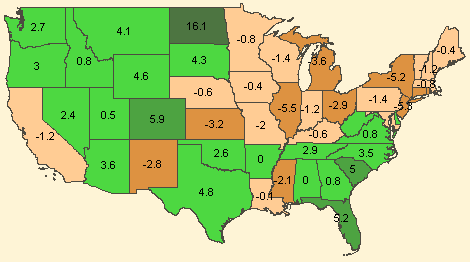 Growth across states ranged from 0.4 percent in New Mexico to 1.9 percent in Mississippi. 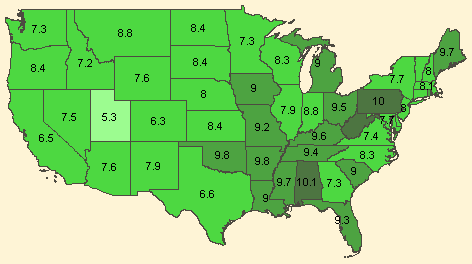 The map presented below shows the percent change in personal income by state over the year 2012Q2 to 2013Q3 (the most recent estimate). Click the graphic to view a larger map that shows more detail and legend. Use this interactive table to view, rank, compare personal income by state based on estimates developed by the Bureau of Economic Analysis. Total personal income is the “tip of the iceberg.” To understand “what is the meaning of these state patterns of total personal income requires looking under the hood. 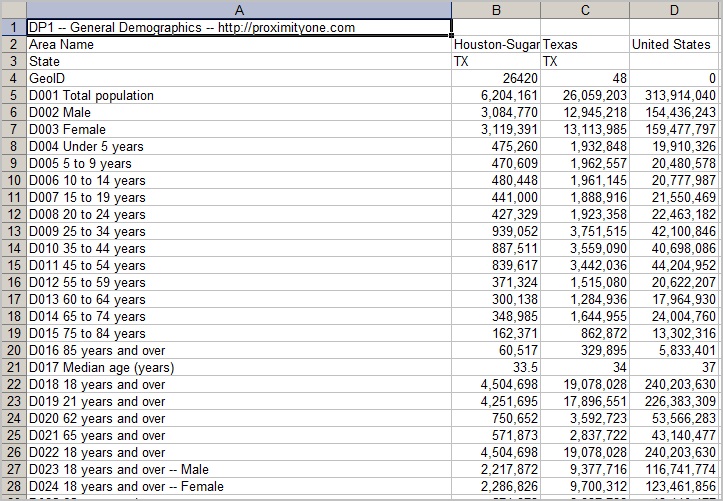 The following more detailed data show estimates of the components of personal income for Texas. (join now, no fee). Use the associated GIS project to visually analyze personal income patterns; integrate your own data. Use Situation & Outlook to access/analyze the more detailed personal income data, integrated with related demographic-economic data. There are more than 50 million road segments in the U.S. While it is most common to view/analyze small area demographics for geographic areas such as census blocks, block groups or census tracts, the focus of this section is on providing demographic attributes for the left and right side of individual road segments. Road corridor demographics are demographics attached to the right- and left-sides of a road/street segment. These are demographics (e.g., population, housing, median income, etc.) for the census block or block group that the road segment faces or passes through. A road/street segment is the section of a road/street between two intersections. Using road corridor demographics, the characteristics of chained/linked road segments, a pathway or a corridor, can be analyzed. Road segments have left- and right-side address ranges and road corridor demographics can be developed through the aggregation of address-oriented data located on the road of interest. Address data can be geocoded and attached to road segement. Examples include customers, housing sales, or patient data on a particular road segment. See more details about developing and using road corridor demographics at road corridor demographics. The tools and methods described there are in production use. They may be applied to any county or higher-level geographic area in the whole U.S. This one-step batch application requires TIGER/Line edges, feature names and faces shapefiles. The CV XE API acquires the demographic data via Internet and codes these demographics into the road corridor shapefile, which is created as the primary output of the process. The application demonstrated at road corridor demographics is focused on Alexandria, Virginia. 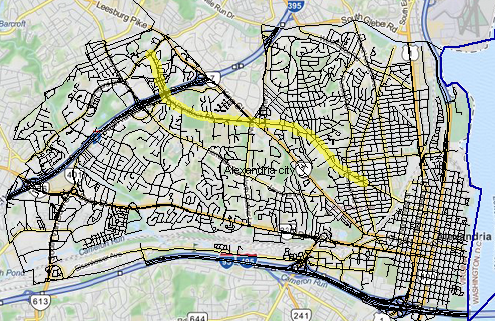 The yellow highlighted road segment in the map graphic below is W. Braddock Road but could be any other set of roads. The CV XE GIS software available to members of the ProximityOne User Group (join now, no fee) can create the basic corridor demographics shapefile for any county in the U.S. The resulting shapefile may be used with CV XE GIS to perform analyses and/or used with other GIS software.